Entrance to the Mirador Kempinski hotel on Le Mont Pèlerin. It's customary to look back over a year of reviewing concluded and remember one's favourite discoveries of premium hifi. Limiting myself to a solid four, I'll pick three award winners and three which I added to my reviewer's tool box. 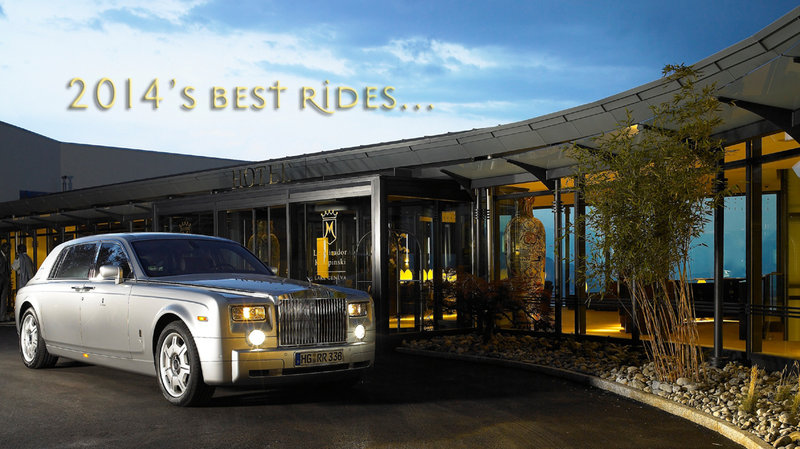 Such reinvestments into the business keep things fresh and create greater variety to mix and match. Click on the component icons to revisit their reviews. 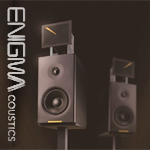 My favourite speaker encounter—and certainly my wife's absolute favourite in years—was the EnigmAcoustics Mythology M1. It's a classic compact 2-way monitor with rear port, matching stand and proprietary drivers augmented by the company's self-biased monopole electrostatic super tweeter. What the combination of larger-than-usual soft dome tweeter and ESL does for airiness, soundstage precision and the recreation of recorded ambiance happened at the top of anything I've heard until now. With cash flow stymied by a move to bigger quarters just then, the M1 made onward tracks to a Swedish importer. But unlike for most anything else, Ivette gave us carte blanche for the Enigma. Should a white finish ever become available—the gloss black is simply too reflective a dust devil—I can raid the household account should anything be in it and without ending up in the dog house. The most remarkable small speaker in recent memory! 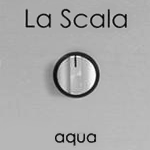 The La Scala MkII DAC from Aqua Hifi of Italy's fashion capitol of Milan became my tube-buffered zero up, down or sideways sampling converter addition this year to complement review systems which due to a given amp/speaker interaction lack some body and weight. That the La Scala gives the feisty one-finger salute to DSD might tell you how I feel about that fashion madness. That it manages an ideal balance between speed and substance tells you why it had my vote. A most analogue digital deck, albeit sans volume control! The COS Engineering D1 from Taiwan became my Metrum Hex replacement in the big rig—the hex meister has since made tracks into the bedroom headfi system where it drives a Bakoon AMP-12R into Audeze LCD-XC—because it adds bona-fide analogue preamp functionality. That serves the picture for when an amp-direct connection really is the desired ticket. 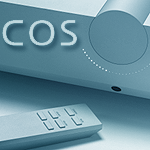 256 x 0.25dB remote-controlled analog volume steps, RCA/XLR analog inputs plus very slick styling have made the COS a very valuable source addition to my hardware inventory. Finally a converter which sounds better amp-direct than adding a $10'000 preamp like the Esoteric C-03! 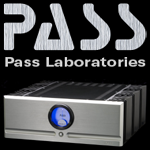 And as my highlight of the year, my favourite component addition of 2014—where favourite is short hand also for most useful—was undoubtedly the Pass Labs XA-30.8 amplifier. Ostensibly 'just' 30 watts of pure class A power, it turns out that its push/pull array of 20 Mosfets per side is good for 90 honest watts before THD hits 1%. Be it my 85dB Albedo Audio Aptica transmission-line floorstanders or the 100dB open-baffle Seligkeit three-way review loaners from Zugspitz Klang, this smallest of the point.8 stereo and mono amp range proved itself most perfect in the driver's seat. It's also one herniating hulkster and true muscle amp, albeit with the resolution, refinement and absentee noise floor we've come to expect from the FirstWatt catalogue. Where colleagues look at Soulution, Vitus & Co. when it comes to so-called super amps of the transistor persuasion, my real-world choice is this $6'500 winner from Nelson Pass. Henceforth it'll be the low-impedance task master for all challenging speaker loads that come through here for review (and those high-efficiency champs which turn out to sound rather better with real current on their arses than some high-impedance micro-power SET nudging 'em along). 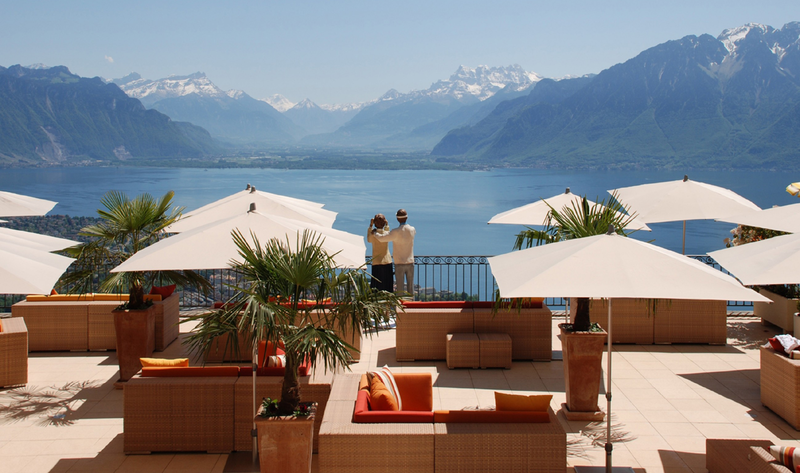 View over the lake's east end from the terrace of the Mirador Kempinski. 2014 also became the year when the appearance of the site got its long overdue tune-up to finally exploit the growth in computer monitor widths which occurred since we launched in 2002. In landscape mode, even an iPad Mini still does the job. Yet 30-inch über monitors no longer look as empty as they did before. It also means bigger photographs so our readers have more to look at. This year my wife also took it upon herself to cruise the real-estate classifieds for half a mind-numbing year until she found us our new digs on Mont Pèlerin. Now we sit a few 100 meters higher up on the same mountain which first hosted us in lower Chardonne after we'd left Cyprus just prior to the massive financial melt-down on the island. I was thoroughly reluctant to move once again. I resisted Ivette's adventurous notions with my very best show of no-can-do. Which, ahem, was clearly not good enough. But, not only are the new views above the Mirador a thing to behold (unless there's heavy cloud cover and we're in the middle of it), we have significantly more usable space; my wife has won a mad room plus paint studio; and the main system's space has grown in size and sound quality and the types of speakers it can properly accommodate. 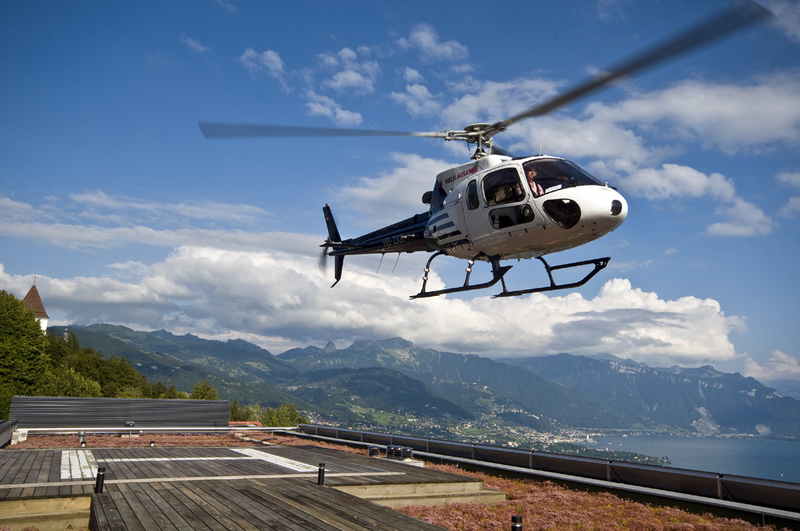 It makes the occasional helicopter pass right in front of our windows a minor nuisance at best when a high-rolling hotel visitor flies in from Lausanne. Despite their super posh and very dear digs, those visitors really are tourists. They leave after a few short days. We are unbelievably fortunate to actually live here for the time being. 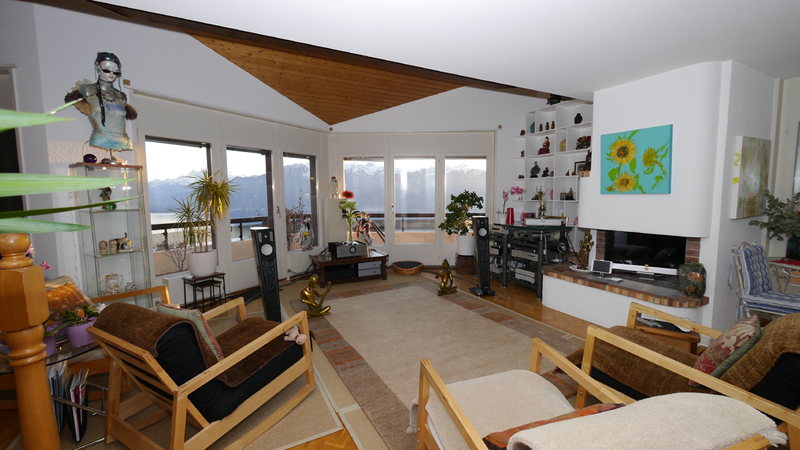 And our visitors are perfectly happy to stay at the Bibiane & René B&B a short ways down the mountain. That's far easier on the creaky wallet and, with just two rooms, far more private too. So, 2014 was a good year all around. Wishing all of our readers a brilliant 2015.